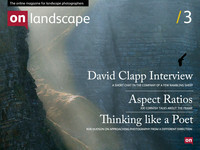 David Clapp, Tim Parkin and Dav Thomas met up in the Peak District just as On Landscape was being formulated. That first interview had a couple of problems (the Canon 5Dmk2 only recorded 12minutes at a time and the Panasonic GH1 only recorded 30 minutes but with bad sound, the main audio ended up corrupted - a litany of learning), however, there was enough content to make a reasonably interesting interview so apologies to David for cutting the odd stream of conversation short, we will repeat again in the near future! (There is a bit of a repeat at the start so apologies for the slightly unprofessional edit - hopefully, even though it's a little raw, it's still interesting for some of you. Better some slightly unprofessional content that none at all?). Just click on the link to the right or the icon below and the video should appear Click to open Interview with David Clapp we also have an iphone/low bandwidth version iphone low bandwidth.